To be fair, it was my roommates 21st birthday the night before, and even though we had practice at 6 a.m. the next morning, I wasn’t going to not go out. I got back to the dorm at 3 a.m. and knew if I fell asleep there wasn’t a chance I was going to wake up, so I just decided to watch some Netflix then head to practice reeking of the Junction. It was what it was, it was the culture we created at the time. Showing up to practice or games hungover was the norm. 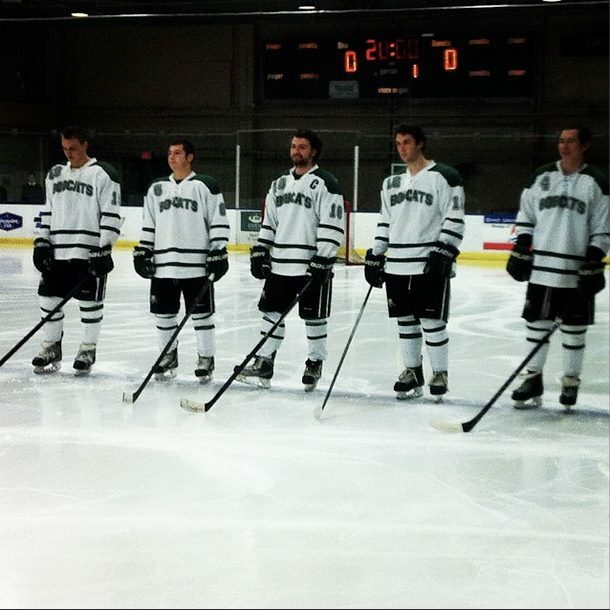 I showed up on Ohio University’s campus in 2009 with every intention of playing division one club hockey. I turned down D3 NCAA offers to be there. The school was perfect and I wanted to contend for a national title. I got to campus, bragged for a week to everyone about how I was going to play hockey (like during those ice breakers on the first day of class), got cut, then had to seemingly live the next four years of my life with my tail tucked between my legs. When news got out to the other programs that had recruited me, a few of them tried to get me to transfer, and I almost did. But, I was determined to work all year on my game and redeem myself sophomore year. Tryouts sophomore year came about and I had, in my mind, the perfect week. I scored goals, played physical, and even grew my hair out so that I could add a little flavor to match my atrocious red equipment from juniors. But it was the same story. I was told that I hadn’t made the top five centers and that I was being cut… again. At the time, I felt like my life was over and that the last 16 or so years of work on the ice was worthless, but looking back it was the best thing to ever happen to me. I thought that the D2 team was going to be used as a farm system for the D1 team. If someone gets hurt, which happens all the time, they would call one of us up to fill the void. Turns out, that wasn’t the case at all, and it honestly makes sense looking back. The D1 team had their identity. They had been on campus for decades and they were damn good every year. They were fast, tough, dominant, and albeit being a club sport, one of the most supported organizations on campus. We, as the new D2 team, had to find our own identity. We decided we were going to be the most fun team on campus. For the first two years, we were a bunch of borderline alcoholics who just happened to play hockey on weekends. For me, the earliest days of the program were embarrassing at times. Our original roster was put together by attending a meeting. No joke, that was the original tryout. You walked into the conference room upstairs at Bird Arena and signed a few sheets of paper, obliged to pay the amount for the year, then showed up at practice the next day. I will never forget the first day of practice. There I was, a former two-time first team All-State selection in high school, captain of my Junior A Tier-III team, now skating with kids who couldn’t make prep JV. Don’t get me wrong, there was still talent sprinkled throughout our lineup. But the first year, it was really thin. Nick Frasse and Sean Roach started the team, and I wonder what was going through their minds as we practiced for those first few weeks. I wonder if they saw the potential of the program, or if they thought they bit off more than they could chew. Both had played D1 before, and now they were stuck with this. We actually had a pretty good inaugural season. We went 13-8-2, and the core members of our team all became really tight. Frasse and Roach installed a lot of traditions that I believe are still in place today, we had 128 N Congress – the hockey house – and by years end, it really felt like a team. As I mentioned, we had to create our own identity as a program, and that first year we did so many ridiculous things. Over the top celebrations were a staple. In the last game of the year against West Virginia, we scored on the power play, and four of the guys all huddled by the net while Jarrod Carley put his glove on the end of his stick and pretended to take a group photo. Classic. After another PP goal, Frasse grabbed me by the back of the pants and threw me down the ice like a curling stone while K.C. Fraize used his stick as a sweeper. We were, by no stretch, over the top ridiculous. And it was the most fun I had ever had playing hockey. My entire life, hockey was a top priority, and I always loved the game, but there was always a serious stipulation behind every game. Playing D2, I realized I could finally relax and actually enjoy playing the game I loved. But at times, we got a little too relaxed. When my junior year rolled around we had finally organized a real, on-ice tryout for the second season of our program. We had a new coach, former D1 captain Phil Oberlin, and he inherited a bunch of guys who he was used to seeing trash the bar he managed. Little by little, we were doing things that began legitimizing us as a program. We joined the TSCHL, which has since grown into a hell of a league, and finally began to develop a few rivals. However, we also continued our ridiculous ways and refused to set boundaries on going out before games and practices. Our homecoming game against Eastern Kentucky my junior year was one of the most ridiculous hockey games I’ve ever been a part of. After winning 17-1 on Friday night, I drank until about 4 a.m., with some of the guys (only the ones 21 and older of course) keeping it going until 7 or 8 in the morning. I went back to sleep, knowing we had a game at 11 a.m. on Saturday, but was woken by my roommate and his older sister who was visiting to go to Broney’s at 6 a.m. for champagne slushies. Running off about 90 minutes of sleep from a six-hour bender, we stayed and drank there for three hours before I told them I had to go the rink. As I stumbled down Court St., I was dragged into The Crystal by one of the bartenders and we took a lunch box, before I finally made it to Bird Arena. I could barely stand, yet alone skate. I looked around the room and realized I wasn’t alone. I took one shift, tried to take a slap shot from the point, got too dizzy when I raised my stick back, fell over, and then benched myself for the rest of the game. Only our freshman and sophomores played that game, and we still won 9-1. Now, this article isn’t about my alcoholic tendencies and the cancer I probably was to our program by encouraging this type of behavior. It’s the fact that it was acceptable. We had made it and deemed it okay. And this was only five years ago. Deep down, we knew we were never going to be a legitimate contender for a national title behaving this way, but we were having the time of our lives. I just want to keep saying, this was the most fun I ever had playing hockey. Heading into my senior year, and the third year of our program, we were really starting to make strides. We had talented players from top to bottom, and were one of the best teams in our league. I, being the idiot that I was, showed up to the first two tryouts a mess. I was one of the leading scorers the two years prior and took that for granted. I was probably the worst player on the ice for those first two days. Before the third tryout, Coach Phil pulled me aside and told me that I wasn’t invincible, and that if I didn’t start taking this seriously, he was going to cut me. It was later this year that the guys and Coach Phil started to try implementing the idea that maybe going out every night before games wasn’t the best idea, but we broke that rule weekly. We were there to have fun first and contend second – that was the atmosphere we created. I remember trying out for the D1 team and the tryouts extend into the first weekend of the school year. The purpose is to have the players not go out and remain focused on the task at hand. It’s a test of will. It was hard to watch all your roommates go out and have a great time while you stayed in the dorm, but it was worth it if you made the team. We tried adding Saturday and Sunday to our tryout schedule senior year and it was hilarious. The vets all went out the night before, and I remember walking into the locker room and half of us being keeled over and lying on the floor. But the new guys abided. They stayed in. They showed up wanting to make the team. I remember thinking that morning that maybe this was the start of something. Maybe one day this would be the norm. Senior year came and went, and so did our first full graduating class. We lost Frasse and Roach, and I was somehow voted the second captain of the program. My final year playing D2 started disastrous. We began the year something like 0-7-2 and I had two game misconducts in the first nine games. Pretty solid leadership on my end. This was really the year that there was tension on whether or not we should go out before games. The three years prior, we were still winning. We’d go out on Friday night, then win on Saturday afternoon. Now that we had created a legitimate schedule, and were playing teams like Miami (OH) and Bowling Green, as opposed to the EKU’s and Wright State’s, our bad habits began to show. We just couldn’t get away with it anymore. I remember all the seniors sat down and we went over a new policy. I’m pretty sure I was the only one of the six seniors who wanted to allow us to still go out before games. We came to a compromise – you can go out, but no getting over the top drunk. It was clear that I may have been the one holding us back from getting over a particular hump, but I was selfish, and wanted to keep doing things the way we had in years prior. We rattled off like 10 or 11 straight wins after our 0-7-2 start, and really began to show that we had the talent to belong. The culture of the team was also changing. Coach Phil was recruiting players, and not just getting bodies, he was getting us legitimate talent. We had freshman who were quickly becoming our best players. They came into the program wanting to win first, and party second, a complete opposite philosophy of what we had been using. It was clear to me that the program was headed in the right direction. I knew that I was probably negatively affecting the locker room in terms of wanting to enjoy my last year of college, and putting that above winning hockey games. But this was the most fun I had ever had playing hockey in my life. Our team was so tight knit, and I wasn’t ready to give up race poker. I knew that once all of the founding players were gone, it would be a completely different program. I knew that Coach Phil needed to get our booze-filled habits away from the new players. I just never thought it would happen so fast, and I’ve never been so happy it did. Two weeks ago, I sat on my couch with my six-month-old son and watched as my former team defeated Toledo (who we were I believe 0-8-1 against when I was in school) to advance to the National Tournament for the first time in our program’s history. All I could do was sit there and mumble “unbelievable.” I must have said it a dozen times. Only three years removed from my captaincy, Coach Phil and the leaders in the locker room completely transformed this team and made them an absolute force in the D2 club hockey world. Looking at the roster, there are ten guys left who were freshman or sophomores when I was in my final year with the team. A lot of them know what it used to be like. And I can’t imagine what it was like to be a part of the transformation. As far as I know, Coach Phil and his younger brother Patrick have this team as tight as ever. I can see on Snapchat the ways they spend their time together on the nights before games, and it’s not taking frozen fours at 1:30 a.m.
We would stand in the tunnel and pretend to be commentators to help ease the pain of watching every single fan leave. But now the D2 team has earned, at the very least, a top-16 finish in the nation. As an alum, the entire reason for this article is to just say how proud I am of all of you. And while I know the crowds aren’t large, and the recognition is hardly there, your alumni is so damn proud of you guys. You guys have all made a sacrifice that I wasn’t willing to make when I had the opportunity, and I’m so damn proud that it’s paying off for everyone in that locker room. I don’t regret any part of my four years playing D2, and I think I speak for every one of my former teammates when I say that, but I also know that there were guys in the locker room who would have given everything to play in the national tournament. Watching you guys defeat Toledo was one of the greatest moments I have ever witnessed. I felt a part of it, even though I was hundreds of miles away. What the players and coaches have done to transform our program into a contender for the national title in such a short amount of time is nothing short of unbelievable. I went to OU wanting to contend for a national title. It’s why I went there. Sure, my path strayed off the straight and narrow, but watching the program I was a part of for four years actually have a shot at doing so is unreal. Soak this weekend in boys, we will all be watching. And win or lose, we will always be proud. If you needed another reminder why hockey fans are awesome, here’s a story from Lac La Biche, Alberta, which is where Rene Bourque‘s parents reside. Facing elimination, the Montreal Canadiens defeated the New York Rangers 7-4 on Tuesday night thanks to three goals from Bourque, who now has eight goals in 16 playoff games. Bourque has been on a roller coaster this season and many Canadiens fans thought he should be dealt at this years trade line. But Bourque has been at his best when it’s mattered most. After only 16 points in 63 regular season games, Bourque has been a spark plug for the Habs and is a main reason why their Stanley Cup hopes are still alive. Lac La Biche is 2,350 miles from the Bell Center, and while Bourque’s parents would have loved to partake in Tuesday night’s madness, they got a little taste of the fun on Wednesday when about a dozen hats were dumped on their lawn to celebrate their son’s hat trick. 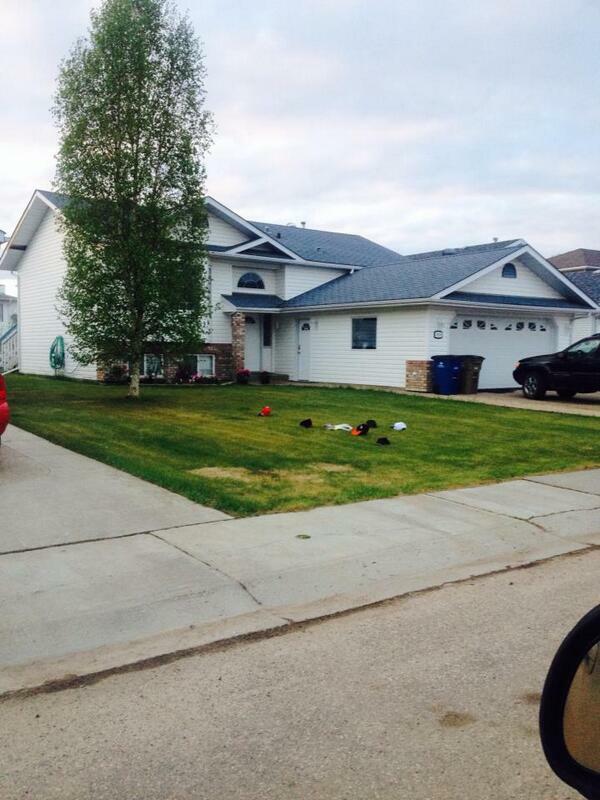 Usually when you hear someone’s yard has been littered, it signifies something negative. For you Friday Night Lights fans out there, the ol’ “For Sale” sign in the coach’s yard is something I’ve seen multiple times. I’ve also heard of brooms being placed by the garage of a coach whose team got swept, but this shows that sometimes littering can be a good thing. Paul “Biz-Nasty” Bissonette of the Phoenix Coyotes called the Canadiens fans at the Bell Center out for being stingy with their lids, but some residents of Lac La Biche tried to make up for it. Habs fans being stingy with the hats. Give em up. Shane Darrow is currently a graduate student at Ohio University studying journalism, you can follow him on Twitter @ShaneDarrow. Milan Lucic showing P.K. Subban the same respect he showed most of the Montreal Canadiens… None. Let me start off by saying that I am not condoning what Milan Lucic said, but as a player it’s clear to me that Montreal Canadiens forward Dale Weise crossed the line. What happens on the ice, stays on the ice; it has always been that way. In case you missed it, after the Canadiens upset the Boston Bruins in game 7 of the Eastern Conference Semifinals, Lucic had some choice words for Weise as they went through the handshake line. “I’m going to f***ing kill you next year,” Lucic said to Weise. At first glance, this is a pretty serious offense. The ceremonial handshake at the end of the series is usually one of the more beautiful moments in the sport, but every so often, something like this happens. 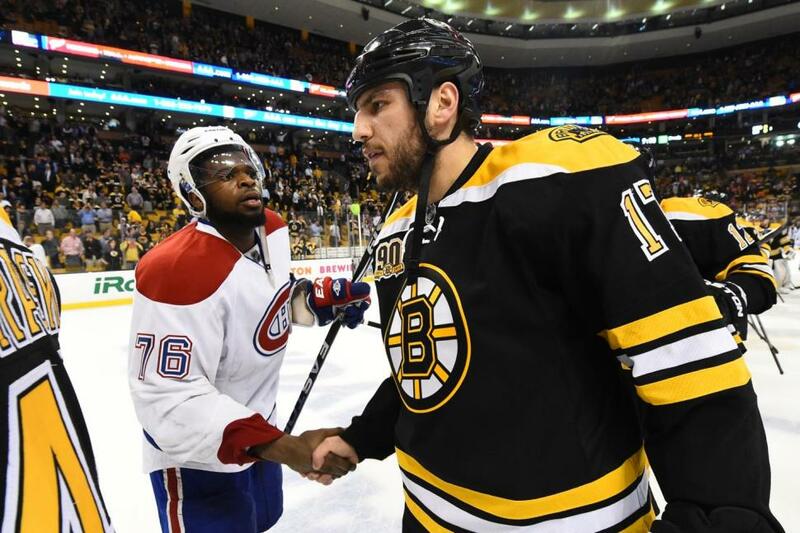 It was later discovered that Canadiens defenseman Andrei Markov told Lucic to look his players in the eye when shaking hands, which most likely rattled Lucic as he approached Weise. Now, anyone that has watched Lucic play couldn’t have been too surprised at his comments, and anyone who has ever gone through a handshake line in hockey knows that it’s not always so friendly. The ol’ “good game, good game, good game, f*** you, good game, good game…” is still alive and well. I’ve done it, you’ve done it, it’s just a part of hockey. What bothered me the most is the media making such a big deal out of this “death threat.” Come on, I can guarantee that there were much worse things said on the ice during the series. Honestly, what Lucic told Weise was rated PG for most of the chirping that takes place during a game. People need to understand what Lucic was trying to do, and that’s get inside Weise’s head, which I guarantee he did because Weise went crying to the media about it after the game. The Bruins and Canadiens are one of the most historic rivalries in the NHL, which means that these two teams will meet often over the next few years. Every time Weise steps on the ice against the Bruins, he’s going to be looking for Lucic. 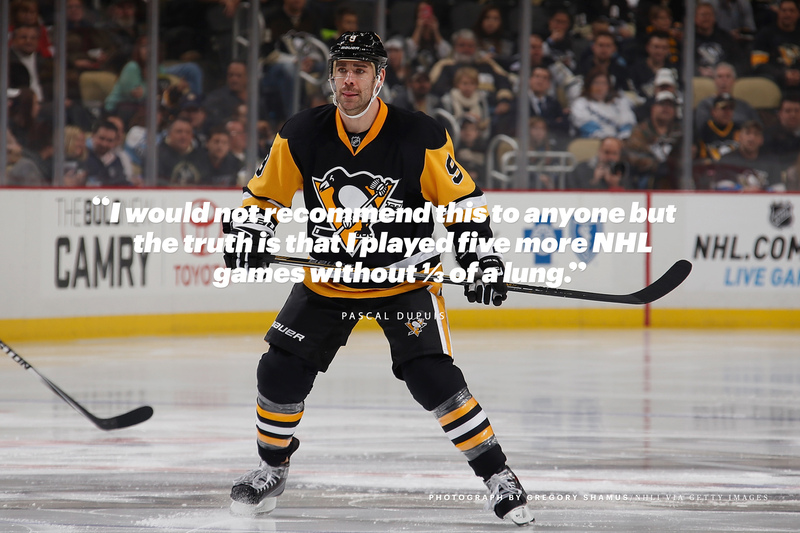 It’s not like Lucic is a 5-foot-10, 200 pound finesse player, either. Lucic is 6-foot-4, 235 pounds and one of the toughest and most fearless guys in today’s game. Other players are scared of him and I have proof. The look on the Sabres’ players as they go after Lucic is priceless. Thomas Vanek, who you could tell wasn’t psyched about having to be the first one in, gets rag dolled by Lucic from a light shove. Then, it’s up to Andrej Sekera to go after Lucic, but his altercation doesn’t pan out too well either. Point is, Lucic is a big, bad man and Weise will be looking for him in the future. I’ll say it again, I’m not condoning what Lucic said in the handshake line, but I do know why he did it; however, the biggest problem I have with the situation is how Weise handled it. After the game, Weise went crying to the media about how he was “threatened” by Lucic. Really? 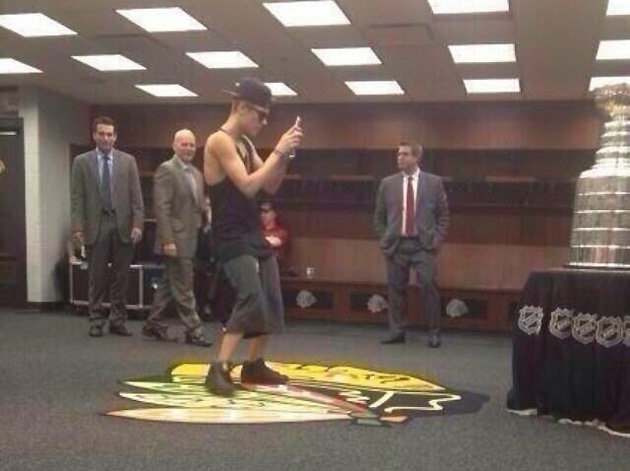 Many believe that hockey players are the toughest athletes in the world and you’re going to tell the media that you were threatened in the handshake line? This wouldn’t even be a story had Weise kept what was said on the ice between him and Lucic. I have no problem with players calling out other players for dirty hits or cheap shots that occur during a game. For example, it was interesting to hear how players felt about Todd Bertuzzi’s career-ending cheap shot on Steve Moore. In 1996, Dino Ciccarelli gave us one of the best sound bites in NHL history after telling the media how he felt about Claude Lemieux. Be a man, Dale. Laugh it off and pour yourself a glass of champagne for upsetting the President Trophy winners, don’t cry to the cameras about how classless Lucic is. Lucic was confronted about Weise’s comments and called him a “baby” for saying what he did. Well Milan, I agree. 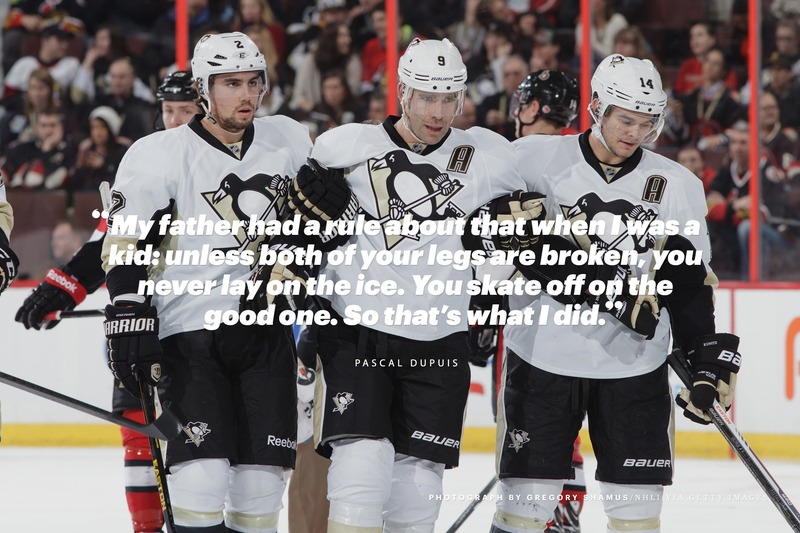 What’s said on the ice, stays on the ice. There aren’t four words that sting harder after you watch the final seconds tick away from their final game. The bar you’re in gets dimmer, the drink your sipping gets chugged, the potential excitement dies and it seems like there’s nothing more to look forward to. Everything starts to bother you. The person in the screen printed T-shirt going ballistic when his team beats yours makes you want to whip a full glass toward them. How big of a fan can you be when you only have a damn T-shirt to watch game 7? Everyone turns into an expert, yourself included. It was the coach, it was goaltending, it was the power play, it was the refs, it was a lack of execution, they weren’t focused, they didn’t play with emotion, the superstars didn’t show up, they took too many penalties, the rink wasn’t cold enough, their plane arrived late… It had to be something. Every year feels like it’s supposed to be the year. 29 fan bases will feel the same way, but that never makes it any easier. You followed the team since the preseason and you know the ins and outs of the roster. Nothing can go wrong. Every conversation over the next few days is about who should be fired, who should be resigned, who should be released, etc. But the thought that there are fans who are looking forward to the next series makes your teeth grind. Why can’t that be us? We deserved it, not them. It took me a few days to calm down so I could write this. Had I written this on the night the Penguins were eliminated I don’t think there would have been too many words spelled correctly. You put yourself in an emotional coma and when you wake up you hope it was all just a nightmare. But it never is, it actually happened. In the end, it’s the beauty of the game and it separates the real fans from the fake ones. Real fans struggle to go on with their every day lives when they know they have to keep their jersey stashed until the Fall. They’ve imagined the night when their captain hoists the Stanley Cup, but that night will have to wait at least one more year. Reality will eventually sink in and people will tell you it’s just a game. It’s only hockey. There’s no reason to get upset over the things you can’t control. They were going to lose in the next series. You’re not personally affected. 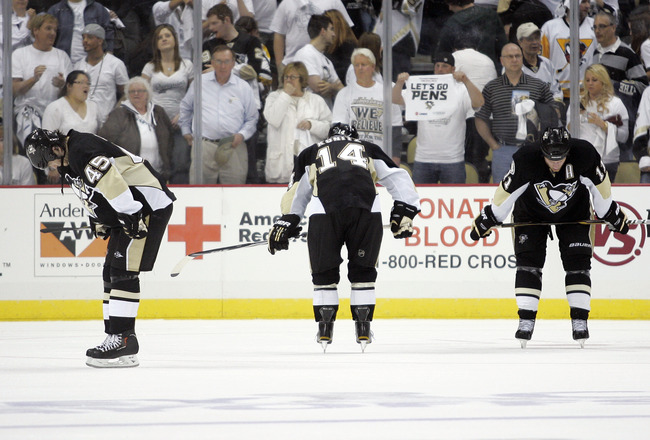 But for most of us, hockey is all we are and all we will ever be. We eat, sleep, breathe and dream the game. It’s one of the worst days of the year for most of us, but it’s also what makes the game so great. Shane Darrow is a graduate student at Ohio University studying journalism. You can follow him on Twitter @ShaneDarrow. Also, please check out Just Dangle Hockey for the best apparel in the business.